Where Did Mario Odyssey’s Level Design Come From? – What's in a Game? We discussed the high-level level design of the 3D Mario, from Mario 64’s sandbox and Galaxy’s linear challenges to Mario 3D World’s tight four-part structure design. It seemed like gamers had to make a choice in 3D platformers: do we want an open world, full of different challenges for us to do that can be confusing to explore or focused levels that gradually increase the challenge of mechanics making it easier for all players to learn? 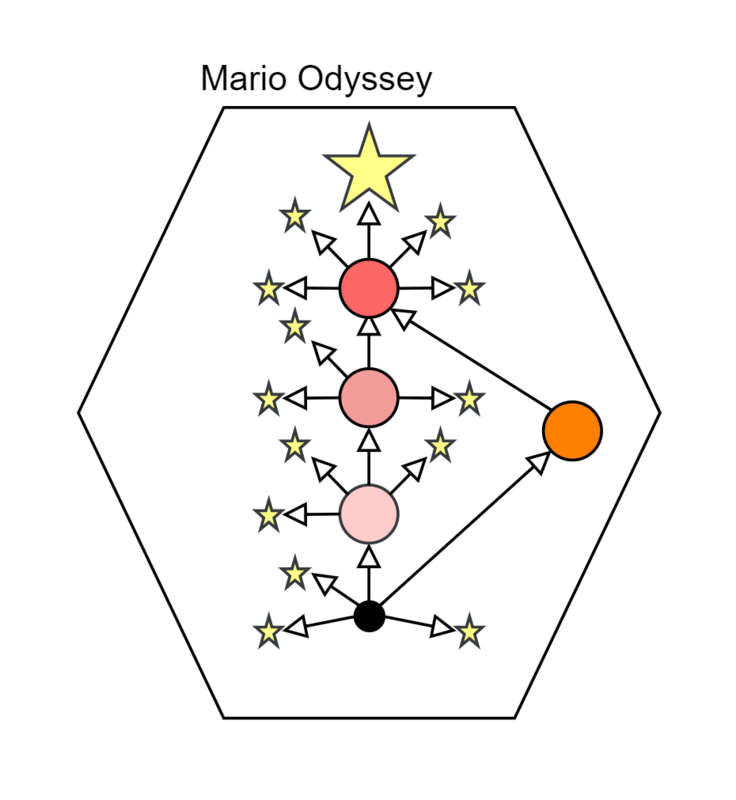 When designing Mario Odyssey, it’s clear Nintendo had both players that want linearity and non-linearity in mind. 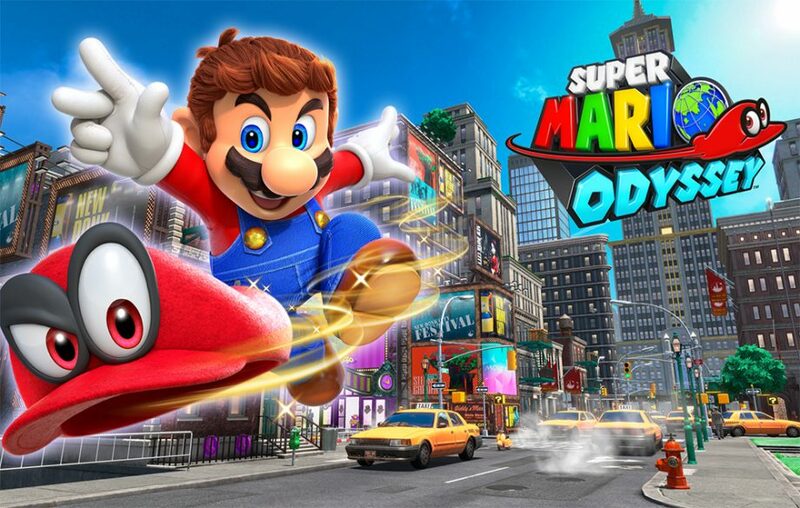 Mario Odyssey’s level design is centered around primary objectives in each world while placed in a sandbox environment with unordered challenges. Where did they come up with this concept? How were they able to merge the two together so seamlessly? Let’s take a look at the two paradigms of 3D platformers by looking at Banjo-Kazooie and Mario 3D World so that we can see how Mario Odyssey combines the best of both. Level Layout: Sandbox – as shown by the large hexagon in the diagram. Players explore a vast world and find their way to challenges. Challenge Layout: Choose your challenge – players can explore the world and choose whichever challenge they want. Challenges are mostly unrelated and unordered. In order to move on to the next level, you need to collect a certain amount of collectibles rewarded from the challenges you complete. As my analysis of Banjo-Kazooie’s level design says, many players love it because of the level layout. They love exploring the vast world and finding secrets! Challenge layering is achieved by choosing the order you complete challenges. Being able to complete challenges in any order present interesting decisions to skilled players, looking for the optimal path through the level. If low-skilled players can’t complete a challenge or two in a world, no problem, they can go complete other strategies. Unfortunately, due to the 3D mechanics, sandbox level layout, and the orderless challenges, players need a certain level of skill to even be able to play the game. Navigation in 3D is complicated, especially when there is no singular goal for the players to navigate towards. This was a major reason 3D platformers died out. Plus, without ordered challenges, it was hard for game designers to naturally increase the difficulty curve, making even harder for players to move forward. Challenge Layout: Use of 4-part structure to teach mechanics and challenge you along the linear path of the level (as shown by the gradually darkening color). I have more detail about 3D World’s level design here. For now, the important thing to know is how Nintendo used 4-part structure to teach players mechanics gradually. The gradual increase in difficulty and obvious goal (reach the flagpole) made 3D World more welcoming to low-skilled players. While genius game design, it resulted in levels that were linear and tiny – enough to make people question whether or not the game was truly a 3D platformer and long for days of Mario 64 and Banjo-Kazooie. Level Layout: Sandbox – as shown by the large hexagon in the diagram. Players explore a vast world and find their way to challenges. There is a clear main goal in each level, which once achieved, unlocks the next main goal. 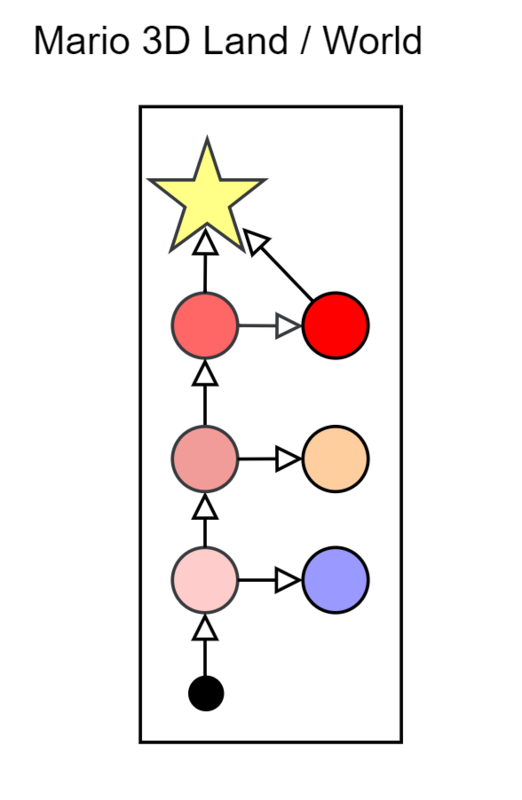 Use of four-part structure to teach mechanics and challenge you along the main linear path of the level (as shown by the gradually darkening color). If a player completes these main goals, they’re rewarded with a multi-moon and shown the way to the next main goal. A plethora of extra moons of various difficulty to collect along the way and out of the way – allowing you to choose which challenges you want to complete. Completing main goals often unlocks more challenges/moons for the player to collect. Skilled players can use complex movement mechanics to skip certain challenges and bypass sections of the level. To get to the next level, you must collect a certain number of moons from this level. Moons you collect in previous worlds don’t contribute to moving you towards the next world, meaning you must complete N challenges in this world. Complex platforming sections often happen in areas where the camera angle is fixed, allowing players to focus on the platforming challenge. What’s the formula? 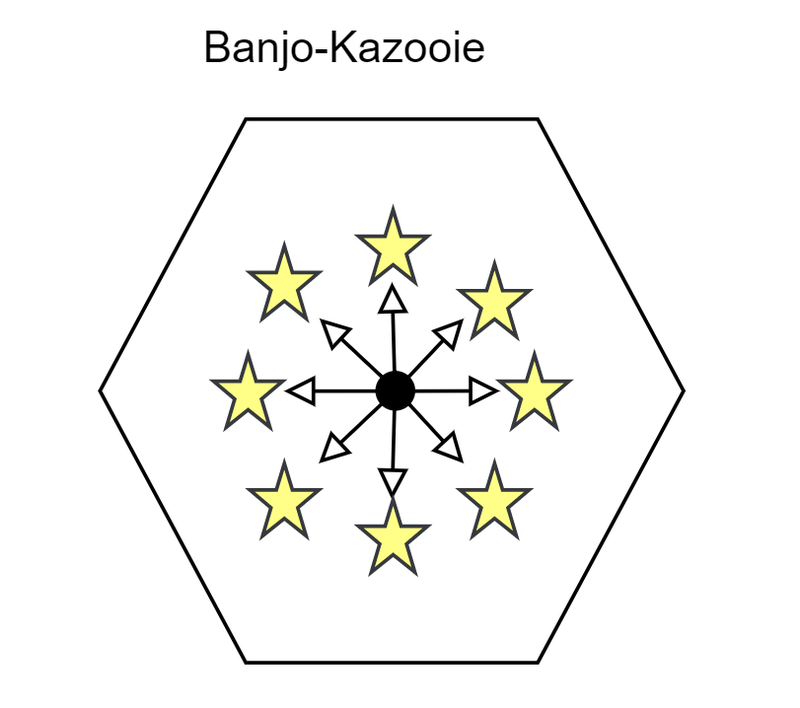 Take Mario 64 or Banjo’s sandbox level layout, 3D World’s challenge progression and obvious goals, then sprinkle in Banjo’s sense of unordered in-level challenges. The result is a game that is obvious and easy to learn to play (for a 3D platformer), but expansive enough to feel like an adventure (an odyssey perhaps) with the added benefit of giving players decisions on the challenges they complete.